A hunt master has been accused of illegally persecuting badgers after he was filmed setting a trap and baiting it with peanuts. The trap later caught a badger but the animal managed to escape before Christopher White returned. The footage was passed to the RSPCA, which said it had "given advice about the legal use of traps". Mr White, who is joint master of the Barlow Hunt, told the BBC he had not seen the video so could not comment. "I can’t get the footage so I’m not commenting on nothing," he said. The BBC then emailed him the footage but he did not respond. An RSPCA spokesperson said: "We were made aware of this video footage and an inspector has in this case given advice about the legal use of traps." Christopher White, a farmer and joint hunt master, was filmed going to the location several times in March and April. The footage was secretly filmed in a Peak District woodland by a group of activists called the Hunt Investigation Team (HIT). A HIT activist said: "Badgers are illegally persecuted for a number of reasons. The Barlow Hunt master may have feared that badgers would reduce the success of the estate’s reared pheasants for shooting or he may have been emboldened by the widening badger cull. "By trapping adults during the spring, he would also eliminate dependent cubs. Whatever his reasons, to take or kill a badger without a license remains a criminal offence." Badgers are protected in England and Wales under the Protection of Badgers Act 1992. Offences under this act include wilfully killing, injuring or taking a badger, or attempting to do so. It is also an offence to cruelly ill-treat a badger. However, licences can be applied for to control badgers in certain circumstances. 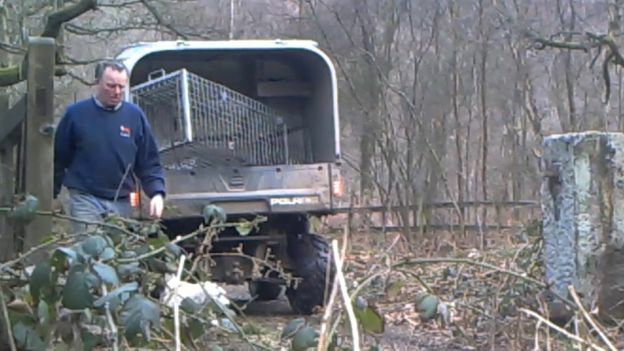 Mr White set the trap on private woodland within the Peak District National Park, west of Dronfield, and was filmed going there several times in March and April. Badgers are not currently subject to a cull in Derbyshire, although an application to grant such a licence is currently being considered by Natural England. Since 2013 licences have been issued in areas of Gloucestershire, Somerset, Cornwall, Herefordshire, Devon, Dorset, Wiltshire, Cheshire and Wales. "The national badger cull programme has emboldened farmers and landowners to persecute badgers freely and with complete disregard for the law," said the HIT activist. "A badger cull in Derbyshire would be clearly disastrous for indigenous wildlife."